As the resident grand dame of Southern California’s Coronado Island, Hotel del Coronado has a “wow” factor even children can’t miss. It hits immediately with its tall red-roofed towers, elegant white verandas and a grand lobby that glitters with chandeliers and dark, rich woodwork. There’s even a hand-operated birdcage elevator taking guests up and down the four floors. Don’t worry about little ones feeling out of place in a hotel that has hosted aviator Charles Lindbergh, English royalty and Marilyn Monroe (here to film the comedy classic “Some Like it Hot”). Kids get VIP lanyards at check-in that lead to a scavenger hunt. 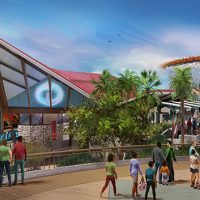 They also get a schedule for day camps, surf lessons and pool hours, plus tips for kid-friendly meals and treats. The sprawling beach behind “the Del” beckons immediately with kids of all ages running through the water and sculpting the sand. It often tops lists of the country’s best beaches. ‘Tweens and teens catch the swells on surfboards and boogie boards, while others go shopping, hang in the teen lounge or spook each other with tales of Kate, the Del’s resident ghost who has a few tricks up her Victorian sleeves. Families fascinated by the military can watch helicopters fly overhead several times a day, spot navy ships in the distance and see special forces occasionally training on the beach or off shore. Jets may also zip across the sky. 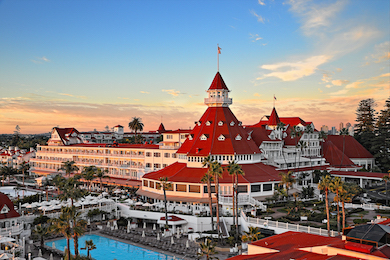 Even without the beach as a vast playground, Hotel del Coronado is a destination on its own and one of the most popular stops for San Diego’s Old Town Trolley tours. At more than 120 years old, its grandeur endures. That makes it a trip-of-a-lifetime for families enchanted by the charm of generations ago. 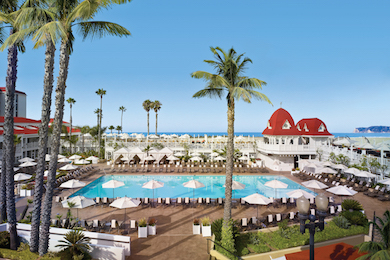 Hotel del Coronado has 679 recently remodeled guest rooms in its historic hotel and Ocean Towers, along with another 78 at the new luxury Beach Village. Together, it's by far the largest property on the island. It's easy to get disoriented in the long hallways of the historic hotel. They sometimes parallel balconies overlooking the inner courtyard or wind between rooms on either side. 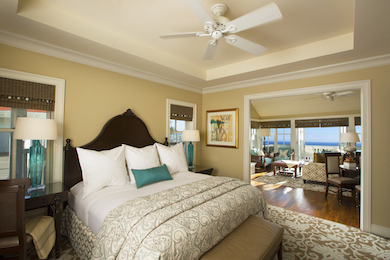 Rooms typically have one or two beds, some with full or partial ocean views and patio or balconies. 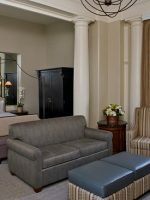 The historic rooms may feature interesting angles and vintage bathroom decor, such as black-and-white tile and pedestal sinks. The Ocean Towers beachfront high-rise next to the historic hotel was built in the 1970's. It features plenty of balconies for enjoying ocean breezes, views of the Pacific or views of the historic hotel. California bungalows are especially popular with families because they're conveniently located between the Del's main pool and the ocean. Rooms open up toward the pool, Kidtopia and Vibz lounge or the beach. In the gated collection of cottages deemed Beach Village, the 78 luxury guestrooms and suites blend seamlessly with the Victorian hotel. This section has its own family pool and infinity pools. Villas have fireplaces and optional balconies and patios and partial or full ocean views. Love this Hotel and all the history! Fun Fun Fun spells a vacay at Hotel del Coronado, the beach is beautiful, good food and a beautiful historic Hotel. The flower garden is a delightful stroll. You will have great memories of staying there. I've stayed at this hotel several times. This time I had to wait 4 hours to check in, which is OK, except once I got to the room, the previous tennant's leftover food was in the minifridge. Someone's long hair in tub. After this, I felt everything must be dirty. Never received requested foam pillows due to allergies. Digital key never worked. Tried calling front desk and never answered. Not my idea of a luxury hotel. Grab towels and complimentary beach chairs for a day at Coronado's vast, beautiful beach. Fog may roll overnight, but the haze usually burns off by mid-morning. Water temperatures are warmest in the summer months, but may still require a wet suit for surfing or paddleboarding. Guests can rent wetsuits, surf and boogie boards, paddleboards and beach umbrellas near the pool and whirlpool. Guests age 6 and older can take group or private lessons catching waves in the Pacific or paddleboarding in the calmer water of Coronado Bay ($90 per person). Summer guests, ages 9 to 16, can really hone their skills with four-hour Surf Camps. Wetsuits and equipment provided. Kidtopia is the Del's three-hour day camps near the main pool give parents a break and kids ages 4 to 12 the chance to play games, make beach bags and tie-dye shirts and get to know other guests their age The program costs $50 for the first child and $45 per additional child. There also are one-hour craft programs for $20 and seasonal Kids Night Outs from 6:30 to 9:30 p.m. with special themes such as pirate maps and lost treasures and Hawaiian luaus ($70). Together, families can grab an innertube for Tuesday dive-in movies in the pool during the summer. The hotel is an easy stroll to downtown for candy shops, ice cream, restaurants, cafes and boutiques. They are usually more affordable than the ones at the hotel -- especially if you're looking for MooTime Creamery's ice cream. Downtown has fast-food tacos (99 cents if you hit the right night), festively lit patios, pub fare, pasta places, sandwich shops, and elegant seafood restaurants. It's also good to stock up on in-room or beach snacks. A beachside hot dog and chips will cost about $11. The downtown is just as charming as the resort with its retro blue neon and chrome. 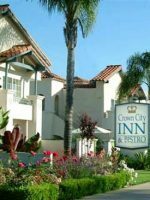 The resort sits about two blocks from the Old Town Trolley, which does 90-minute narrated tours of San Diego and its top attractions. The jokes and sound bites can be schmaltzy, but it's a good overview and easy way to hit the highlights and catch another trolley at Balboa Park and the zoo, Old Town San Diego, the harbor and USS Midway. The company also runs San Diego SEAL tours using amphibious vehicles for trips through downtown and into the harbor. 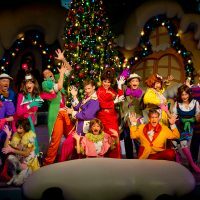 Tickets run $16-$19 for kids ages 4 to 12 or $32-$34 per adult. Seven-speed bikes, cruisers, tandems, kids' bikes, trailers and surreys can be rented through PeDels for exploring downtown or the island's 15-mile trail. Rentals include helmets and locks. Guided bike tours are optional. While the resort does not allow skateboards or rollerblades, but there is a world-class 16,000-square-foot skateboard park on the island with ramps, bowls, grinds and jumps. The hotel's fitness area includes weight and cardio equipment, along with aerobics, spin, zumba and Pilates classes. Guests who crave a more one-of-a-kind experiences can join a yoga or meditation class on the beach, with occasional options for kids' yoga (6 to 15 years old) along the Pacific. 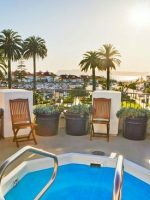 The Del does offer some bundled attraction and lodging packages that may include admission to Sea World, the San Diego Zoo and Wild Animal Park. Extras are also available, such as a surrey bike rental, beach umbrella and private s'mores campfire on the beach. 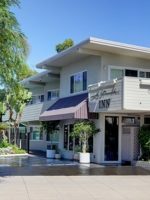 Adjacent to the hotel, Coronado Boathouse rents sailboats, speedboats, water skis, jet skis, paddleboats and kayaks or offers guided sailboat trips. There are several shops right at Hotel del Coronado, including women's boutiques, a jewelry store, men's clothing and sportswear, and The Toy Castle with night goggles, LEGOs, puppets, water toys, craft kids, travel games and other fun stuff for kids. More shops are within a few blocks of the hotel on Orange Avenue. Dining at the Del can be pricey, but views are superb. The restaurants, from casual poolside grills to the upscale wine and chocolate bar, do a nice job of getting diners outdoors overlooking the ocean. They keep the chill off with plexiglass, heaters and even cozy outdoor fireplaces. The Del's more casual restaurant focuses on fresh seafood and local ingredients, but the biggest hit with kids may be its extensive breakfast buffet. They can pile plates with sweet rolls and bacon, croissants and chicken-mango sausage, ham-and-egg souffle, pancakes, fresh fruit and made-to-order omelets (including a zesty Baja version). This is the place for sumptuous, creative dining while facing the sunset. One popular option is the $75 tasting menu with a pick of appetizer, salad or soup, entree and dessert. A sample of the choices: ricotta-stuffed squash blossoms, black spaghetti made with squid ink and sprinkled with sea urchin and crab, veal, short ribs, lobster-stuffed chicken, and a trio of fresh fruit sorbets. Here's a great surprise: children's meals are only $5 and include cheese Panini, fish of the day, macaroni and cheese and even a small steak with sides such as mashed potatoes and watermelon. With its ornate 46-foot mahogany bar, this popular hangout feels elegant yet casual and family-friendly. On the menu are tropical drinks, California wines, flatbread pizzas and other light fare. The adjacent Babcock Bakery is a hub for families who want to grab something picnic-appropriate, such as French baguette sandwiches with roasted turkey, fig jam and brie, Thai Asian Citrus salad. Sweet cakes and tarts are offered for dessert. Beach vacations and ice cream shops go together like buckets and shovels, and MooTime Creamery is clearly the resort's sweetest way to cool off. If your kids are indecisive, have them narrow their choices before facing the daunting task of choosing from three cases of ice cream, plus everything from brownie chunks to gummi worms that get smooshed into it. There also are plenty of smoothies, sorbets and sundaes such as malted chocolate and apple pie. Families gather here for thick wedges of fudge, decadent cashew turtles, buttery English toffee, gourmet chocolate bars and crisp little cookies dubbed "Plain Janes." 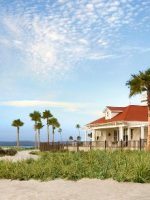 The hotel can arrive child care through the resort concierge service, but it also works to time dinner (or adjust reservations) to coincide with an infant's nap time or to take advantage of the Del's onsite entertainment for older kids. Kidtopia and Kids Night Out are designed for the 4-12 set, while the unsupervised Vibz lounge is aimed at teens. See Activities section for more details. Hotel del Coronado does not allow bare feet and swim attire in the lobby, and all kids have a curfew of 11 p.m. in the city of Coronado. You can rent bikes from the resort or grab a taxi. The Coronado Ferry Company or San Diego Water Taxi takes passengers across the harbor to downtown. You can rent a car through the concierge service or pay $25 per day to self-park at the resort. Besides the $25 self-park fee, there is a $25 per day resort fee that covers in-room coffee, the newspaper, Internet, fitness facility and discounts at several major attractions. When summer crowds hit, it can be disorienting to keep tabs on everyone, especially with waves that nudge kids down the beach. Have kids memorize a landmark to help find where your spot on the sand is. Make sure it isn't something generic, such as lifeguard stands (which are numerous). Ask the Californians when the best time to visit is, and they'll easily tell you it's fall. Price drop, but idyllic weather lingers. That may not be practical with school-aged kids, but parents of toddlers and preschoolers can benefit -- especially when it comes to keep track of roaming kids on less-crowded beaches. Coronado Island sits 120 miles south of Los Angeles, 16 miles north of the Mexican border and 14 miles from the San Diego International Airport. It's separated from San Diego by a sweeping two-mile bridge that leads to the five-square-mile peninsula shared by military bases, residents and resorts. Amtrak's passenger train heads to San Diego, where buses, water taxi and a ferry will shuttle visitors to Coronado. There is a Hertz desk right at the hotel for arranging car rentals. 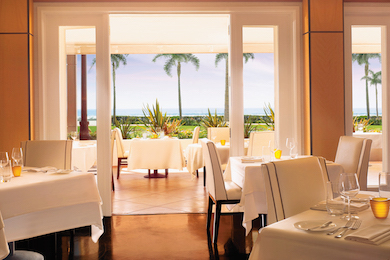 While kids are at Kidtopia or the Vibz lounge for teens, parents can savor a sophisticated early dinner or at least cocktails with ocean views at the Del's restaurants. There are cozy fire pits in front of Ocean 1500 or at the ENO wine bar, where servers help guests discover the best combinations among 300 wines, gourmet cheeses and artisan chocolate. For a luxury splurge, this spa with massages, hydrotreatments and other indulgences, is considered among the best hotel spas in the world. 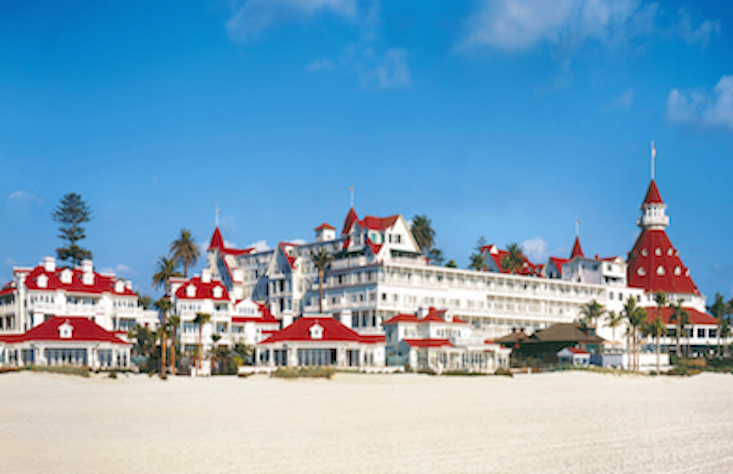 While there were no skilled therapists when the Del opened in 1888, it still plays off its early approach to health with fresh air and calming lull of waves. Relaxation areas with a fire pit and infinity pool let guests linger before returning to the family hubbub. Teens age 13 or older are allowed at the spa with consent of a parent.